Do ducks count as amphibians? Do penguins count as birds? It wouldn't be an exaggeration to say that I have learned the most about how my child thinks and what she knows by watching what she does (while making things, while at play, while talking to others) and then initiating conversations based on what I notice. The more I do this the more accustomed she's become to me asking "How do you know?" or "Can you tell me how you thought to do it that way?" And I have become much better at staying present in the conversation and really listening to her answers. For the most part they are often surprising and delightful. My approach to having (usually math-related) conversations has generally been to keep my eyes and ears open and jumping on any opportunities. But not all the time. 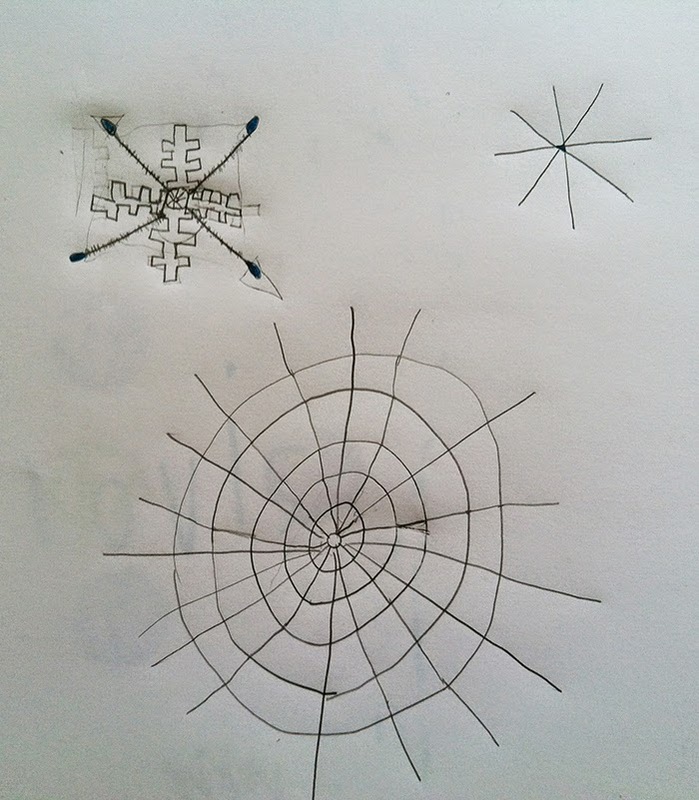 Here's the story of what happened when I set out something I truly hoped she'd interact with in a mathematical way. I recently found all these animals in a basket for $5.00 at a garage sale. She was with me but, at the time, wasn't really interested. I took them home. Later in the afternoon I washed them. I waited to see if she'd notice them. SHE DID!! The minute she saw them she was FULL of ideas. A mile a minute, the ideas gushed out of her: "Let's sort them into categories! I'm going to make a zoo! I'm going to make a pile of cats and a pile of dogs. And we'll give all the horses to Alice..."
"...now I'm going to put them into lines. The darker colors here, the lighter colors here. See? Take a picture of the cats, too. But make sure NO other animals are in the picture." And here I'll pause to say that her inclination to sort, classify, arrange, and organize by attribute seems to me to be the essence of mathematical activity, and a thinking skill useful and applicable at all levels of mathematics. Over the course of the next hour she narrated what she was thinking and what she was going to do next. During this time I had ample opportunity to listen to her reasoning, ask her questions to challenge her thinking and clarify my understanding of the choices she was making as she physically and mentally sorted the animals within the framework of her elaborate narrative. 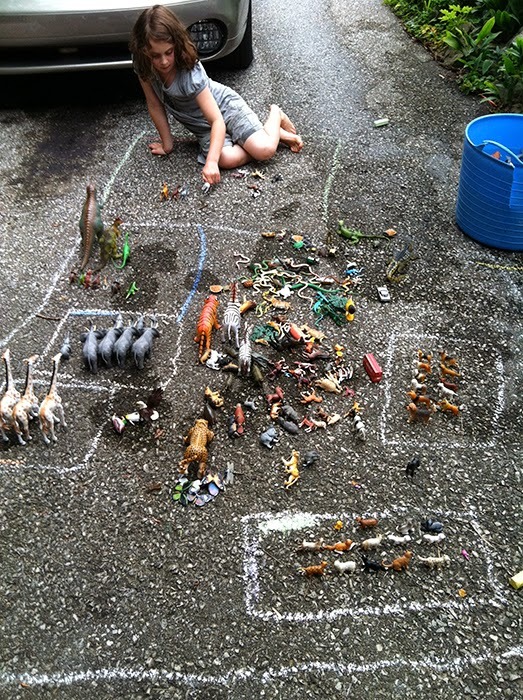 She had decided to make a zoo. Each category (her words) of animal would be in its own area and assigned a color. Here's where things got interesting. Green was the color for all the cats, but the "tame cats" got a second color as well (purple). Wildcats were in a different pen but still in the green category. The lone mouse got put into the cat pen "so the cats can play with it." Orange was for giraffes. Elephants were light blue. Dinosaurs "will need a big area because they're, well...dinosaurs. Birds will go with dinosaurs because they're part of the same family." Her plans were big: "We'll record how many of each and make a graph. I'll put them in arrays of fives if possible." (I love that in addition to the sorting and classifying she also thought of them as potential data and that they could be organized in arrays to help the counting process). For the most part she stuck with the arrays (except for a few categories). 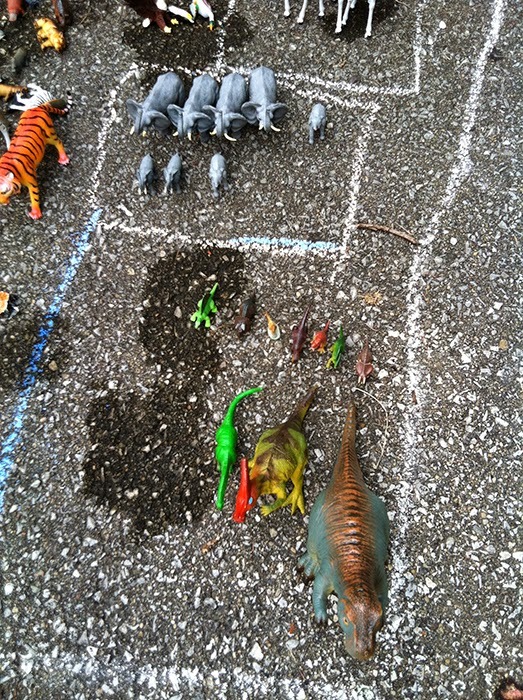 In the picture above she sorted the dinosaurs into lines of small and big, but not the rhinos. When asked about this, she didn't really want to talk about it. Too busy with the next thing, I think. Then came the sea creatures. 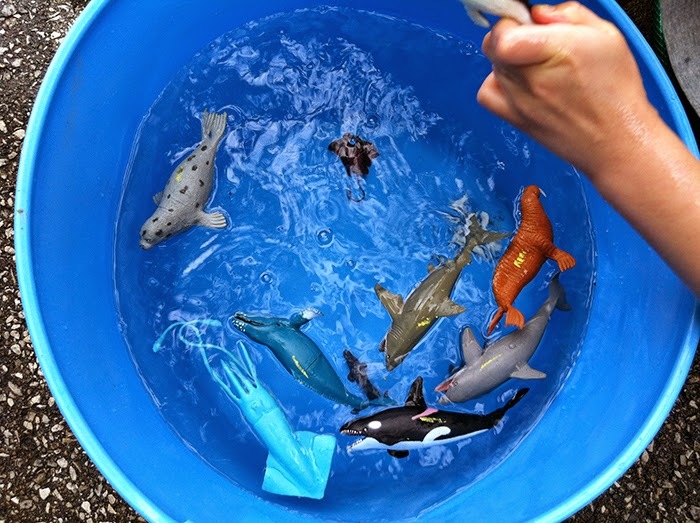 She put them in a bucket of water because "they just need a place to swim." 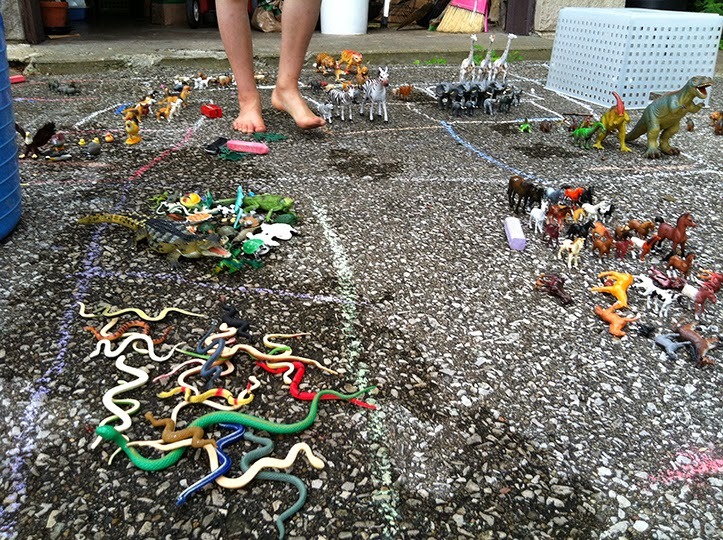 She started to put the crocodiles and turtles in too. "Wait a minute!" I said. "Those are amphibians. They live in water and on land. Do they belong with the sea creatures?" 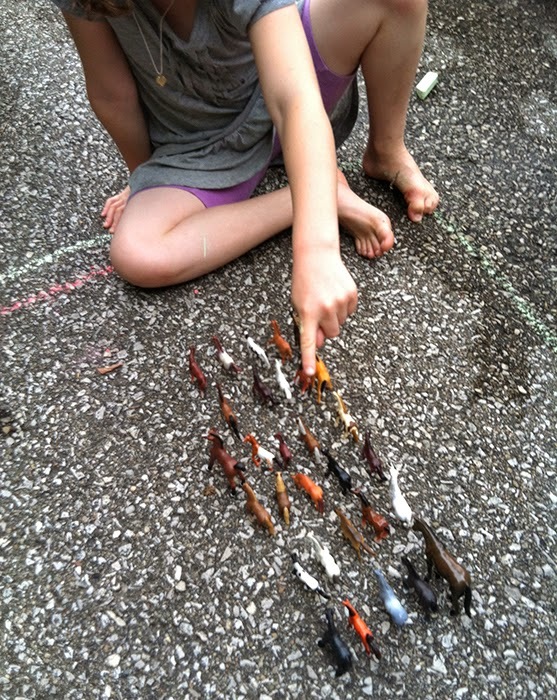 She decided she'd sort the amphibians out another way, but decided to add a yellow mark to the sea creatures "so they don't get confused for the amphibians. And, they might wander off." Do ducks count as amphibians? [Why do you ask that?] Well, they are on land and in water. Do penguins count as birds? Are hippos amphibians? [Why?] Cause they go in water too. I always thought they were amphibians. 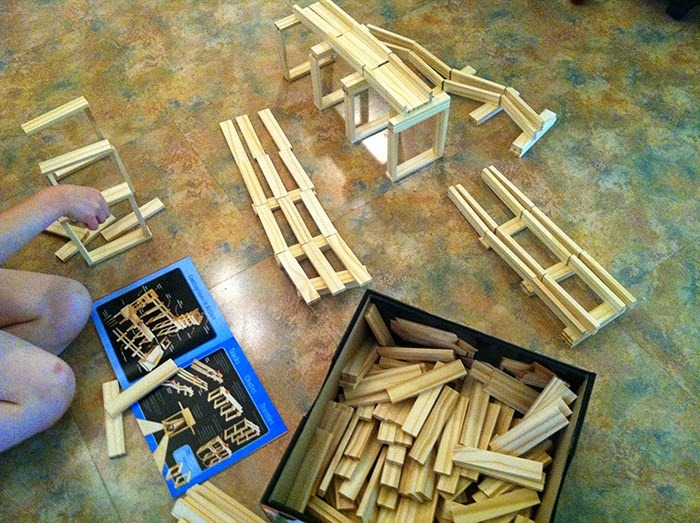 As she continued she built an extension for the zoo to make room for the 30 horses. 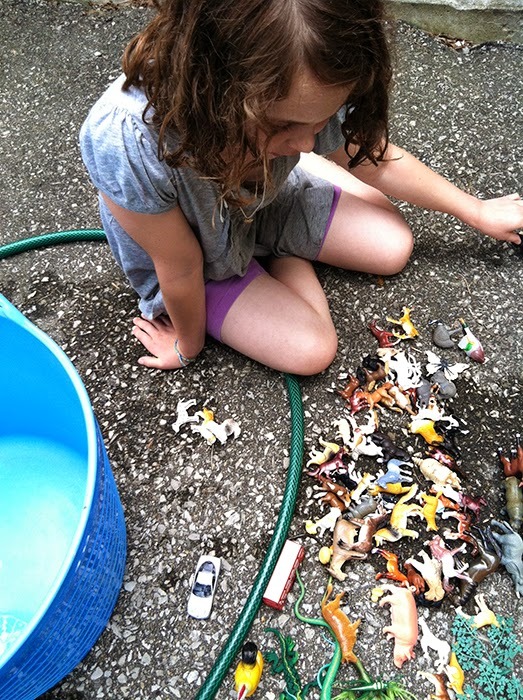 Earlier, as I washed and sorted the animals into loose categories (that's just how my brain rolls) I had wondered what she might do with all these creatures and, if it was sorting, what kinds of categories she might choose. 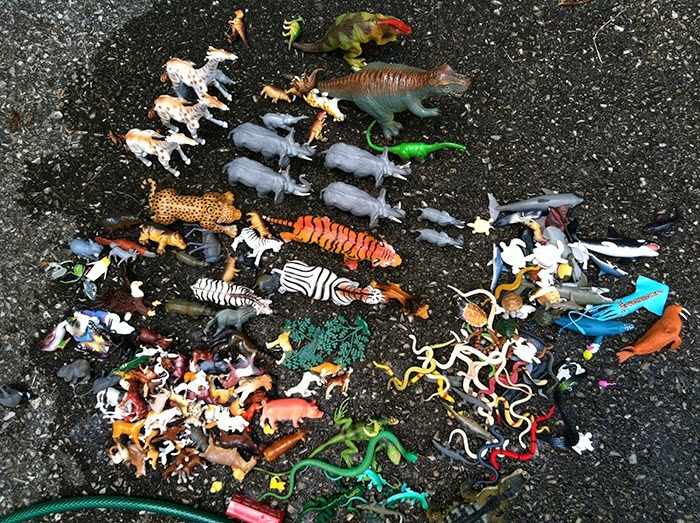 I started my sort by grouping by animal type (zebras, horses, cats, dogs, dinosaurs, etc.) but pretty soon created categories to include a wider definition. 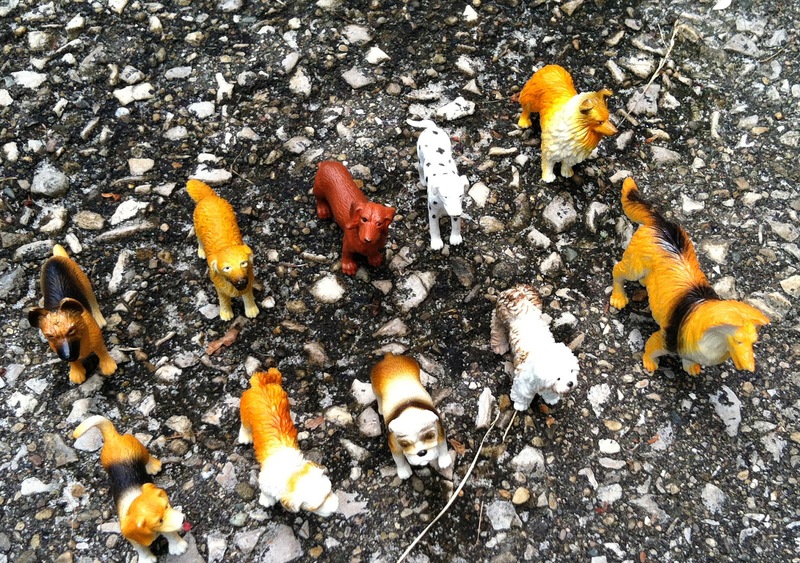 So, in addition to cats and dogs I also had "farm animals," "sea creatures," "animals from Australia," etc. That's how it went for her too, although our categories differed. What I called sea creatures ended up as "water animals" and "amphibians" for her. There was also a fascinating category she initially called "under three" which was a catch all for any small animal group. All creatures with "under three" members would be put in a pen together. I got confused and thought it meant "three and under" but she was clear "under three" meant TWO. I asked her why she hadn't called it "two and under" but I got the brush off. It took an HOUR of sorting, arranging, categorizing, planning and organizing for her (and about a million mosquito bites for me) before her zoo was complete. I was exhausted. The kid, on the other hand? "And now!? We need to organize the tours!" And here I'll make a pitch for Talking Math with Your Kids and Doing Science with Your Kids ('cause you know we did both, right?). Both sites (and conversations via Twitter hastags - #tmwyk and #dswyk) provide incredibly strong, real-life models for how to have mathy and science-y conversations with your kids just by listening to what they have to say and going from there. Don't delay, talk science and math with your kids today! 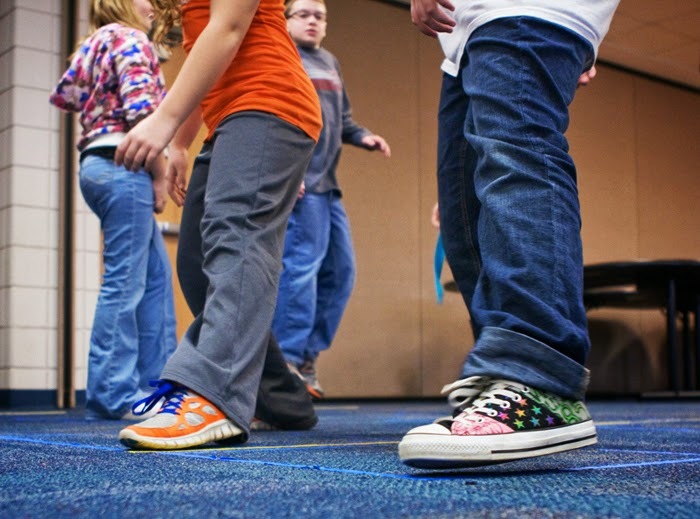 Math in Your Feet is back in Connecticut this July! Join physical educators, classroom teachers, music teachers and math specialists who would like to insure physically active schools in a professional learning workshop sponsored by the Connecticut Association for Health, Physical Education, Recreation and Dance (CAHPERD) and presented by Malke Rosenfeld. Visit the CAHPERD website for more details and to REGISTER for the event. In the last few months I've been thinking, reading and having conversations about some (inter)related ideas in regards to math learning. 1. We should pay attention to building spatial reasoning skills in our students. This newly published document from the Ontario Ministry of Education is a gold mine of ideas and conceptual support. 2. We should provide our students with diverse opportunities to experience a math idea in multiple modes and settings. Suzanne Alejandre at The Math Forum and I had a fabulous conversation about this idea in the comments of her post What's in a Touch. 3. The body can have many useful roles in math learning. One of those roles is to act as a "disruption of scale," a phrase I found reading Jasmine Ma's dissertation. 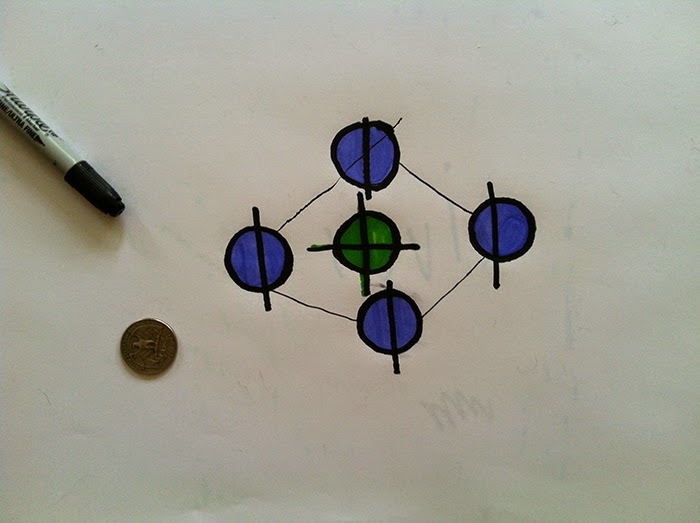 Scale disruption generally means that we take familiar math off the page (exploration of polygons or work on a number line, for example) and make it body-scale which has the great potential for helping students build new insights about the math idea in question. I have LOTS of ideas for these kinds of lessons, but I also think that changing the scale of any lesson, even if it's not at body-scale, can have a positive impact on learning. Not surprisingly, all this thinking and reading and conversing has influenced what's going on at home. It turns out encouraging new ways to explore space and changing scale can lead to very interesting and inspiring outcomes! One day I noticed that my kid, never one for block play but with a penchant for map making and for exploring the world with her whole body, started playing with blocks. It was fun to hang out with her and interact within this new realm; I loved listening to her talk through her building -- definitely a new perspective for both of us! So I got more blocks. And encouraged a generous uncle to buy even more. The most amazing thing was to watch her building from a set of visual directions; amazing because she's not usually one to follow someone else's patterns, preferring to make her own, and also because I was so happy she was having a completely, brand new experience in this realm. Then there was the day I was walking through a big box store and passed the isle with paper and drawing supplies. All of a sudden I noticed a BIG pad of paper, much larger than her normal canvas. I thought, "I wonder what she'd draw if I got her THAT?" Her drawings got BIGGER and the subject matter switched something other than very fine images of cats and girls in dresses. 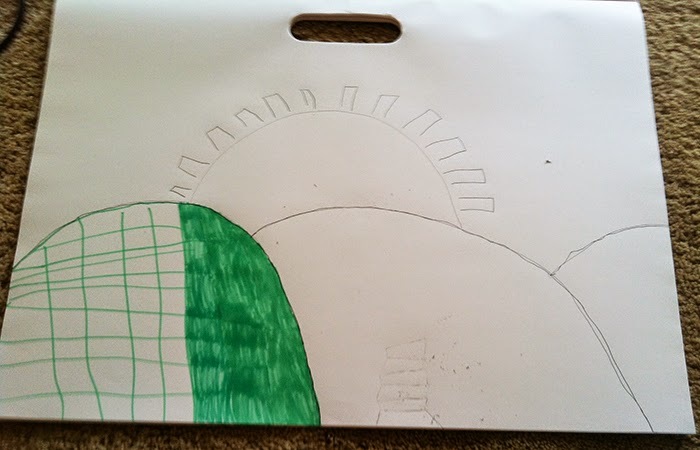 She drew Cahokia Mounds near St. Louis. She "sectioned off" one of the mounds with a GRID, to help her color. 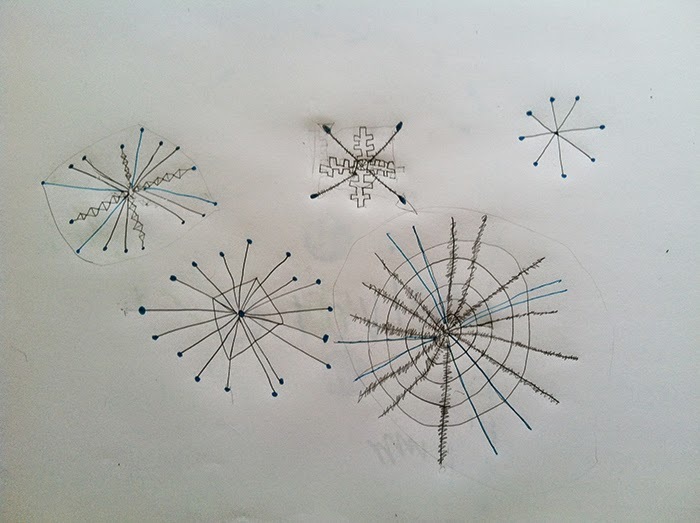 Not sure of the logic, but this was the first time I had seen her draw a grid using long lines, instead of drawing out individual cells. It's St. Louis and it's FULL of spatial concepts: grids, relative size, relationships (front, back, over, under), some perspective. 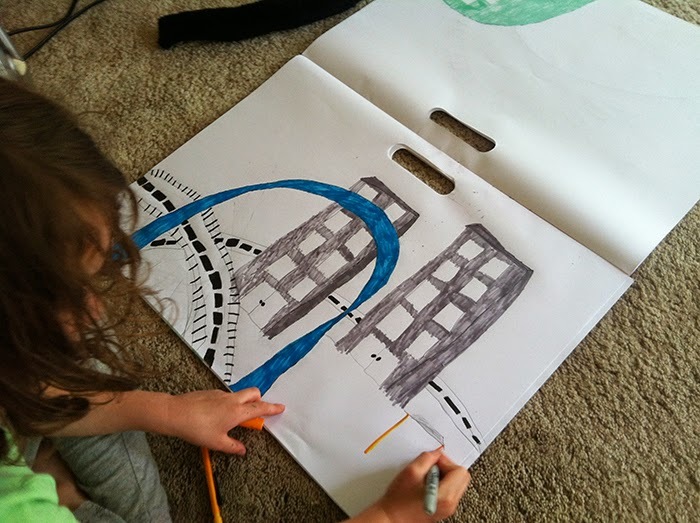 A bigger pad of paper inspired her to draw a city, y'all. Cities are BIG. This last image was interesting to me. She took a quarter and traced around it on the big pad to create this design. 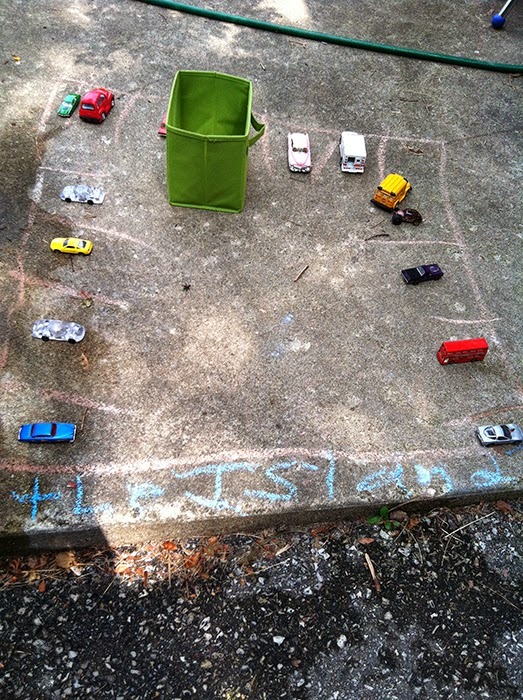 What ways can you think of to change the scale or the mode of exploration for a math idea in your children's life? Try something and let me know -- I'd be fascinated to hear what new ideas, expressions and insights might emerge.